They were proceeding toward the altar singing the Litanies. They were more than two hun­dred young religious representing over forty Institutes, who were invoking their Founders, adding to the name an expression which would symbolize his spiritual character, his charism. Anthony M. Zaccaria was defined as the "Spouse of the Cross." "To go by the way of the Cross" is for Anthony Mary a synonym for Christian life and, ultimately, for holiness, if it is true that it consists in "giving back the talents given us by Christ Crucified." But holiness is only a generic expression of good intentions if it does not become concrete in specific efforts. This is why Anthony Mary always accompanies his teaching with precise, accurate, and exacting demands. Who would forget his characteristic way of express­ing himself, "Run away, run away from it" he says about lies; "Eliminate, eliminate the offense of your neighbor," "Stand up, stand up and try to satisfy your debt," that is, to do your duty in keeping: he Commandments; "Go, go" to Holy Communion; "Get rid, get rid" of the weights which prevent you from going to perfection. "My friend," Zaccaria writes to the lay Charles Magni, for sure older than himself and from a higher social level, "I beg you, if my words are of any value to you, I compel you in Christ: please, your eyes and pay attention to what I have written, and try to read it not only with the lips but with facts. I promise you that for sure you will become a different person from the one you are now, in the way you are supposed to be" (Letter III). Anthony Mary is convinced of the generating power of his words, which contain: "I do not know what" "of great advantage to you" (Letter XI) "able to lead to higher perfection" (he says. to "consumed" holiness), that is, full and tested. He used to conclude his exhortations to the laity in St. Vitale, Cremona, with suggestions and demands, like: "I want to lead a spiritual life ... I want to have God always in my heart. I will prepare my heart for God in full truth, simplicity, and sincerity. In his grace may God live forever in my heart and make it His temple" (Sermon II). "Imitate Christ, imitate God, be full of mercy…, feed the hungry, give drink to the thirsty, the naked, welcome the stranger, visit the sick, free the prisoners ... Plan your activities, perform them for the love of God, have a right intention, select the best, do the right and in everything may you be motivated by charity" (Sermon III). "I want to conquer this love" and this is why "I will submit myself to all, I will be humble and will go along with all, so that God, in his goodness, may put my heart on fire" (Sermon IV). 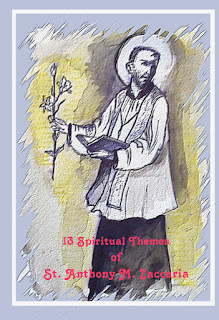 Throughout the writings of the Saint we find suggestions not less lively as he invites to obtain "true integrity of body and soul," "to long for poverty," to "getting along in sincerity and simplicity with everybody," where "getting along" (push) indicates the dynamism of Christian life and moral conduct: to practice “a voluntary humiliation of oneself," to "put aside their own feelings and their own opinions" (Sermon III), to "long with avidity" for the nourishment of Holy Scripture (cf Constitutions VIII), to "always delight in pondering over some good things" (Constitutions X). "If someone is very dear to you, you will love the things he loves and values" (Sermon IV). Zaccaria reminds us. It is like as if he was saying to us if you love me, you have to share what I love, my tastes, my preferences, perhaps even my…"strange ways," if it is true that the saints have been defined as "deviant personalities," understood, of course, according to the ordinary routine of hu­man life. From the principle mentioned above, Anthony Mary derives immediate and decisive con­clusions: "You have the duty to please me…," "I am ready to shed my blood for you, so long as you do this" (Letter XI). So those who have Anthony Mary as their spiritual father and guide are confronted by a call and a challenge. We have to welcome these challenges and make a program of life out of them, assisted by the blessing of our Father: "We have prayed Christ Crucified. We do not want anything from Him, unless it is in accordance with you and your desires" (Letter VIII). How true are the words of the Saint, "I will ... spent time in consultation in front of the Crucified Lord" (Letter III). He lives at the presence of the Crucified-Risen Lord and intercedes for all of us, wanting to conquer us to the love of God, since, "He does not want to give to anyone but to his friends and faithful disciples the gift of perfection, the taste of God, the knowledge of His secrets" (Sermon III).